This should be read as something of a footnote to my previous article on the magi. 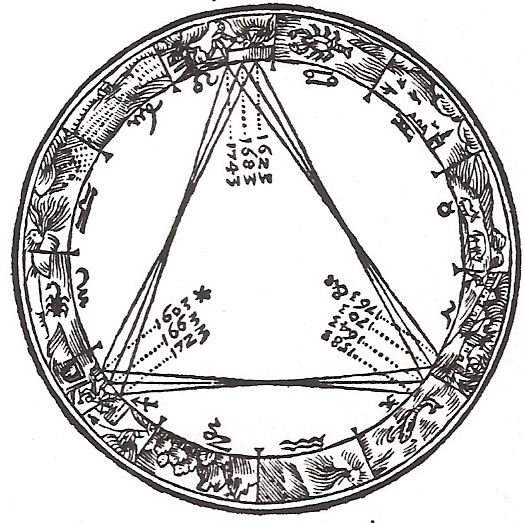 Ferrari d’Occhieppo was a well-known astronomer and his work on the Star of Bethlehem became the foundation of a theory that is seldom questioned. It is satisfying mostly because it is rooted in the notion that Jesus was to be the harbinger of the Age of Pisces. I came upon this theory after I wrote my last article on the magi and believe it merits some response. I personally find several reasons to questions this classic attempt to discover the birthdate for Jesus using astronomy as well as astrology. It has a very rationally basis on the Superior Conjunction of Jupiter and Saturn which occur approximately every 20 years. The observation of the Superior Conjunction was ancient by the time the magi would have seen this one. They are considered important markers for change, including social and regime change. To some extent, we’re comparing apples to oranges. The article I wrote was designed to discover what the magi probably saw when they spoke of the Star in the East which would lead to the King of the Jews. The article under review purports to discover the birth of Jesus. Surely the two events were significantly far apart if the magi came from what is now Iran. Nevertheless, the two events are obviously connected. The underlying assumptions strike me as bold, compelling and for the most part, speculative. 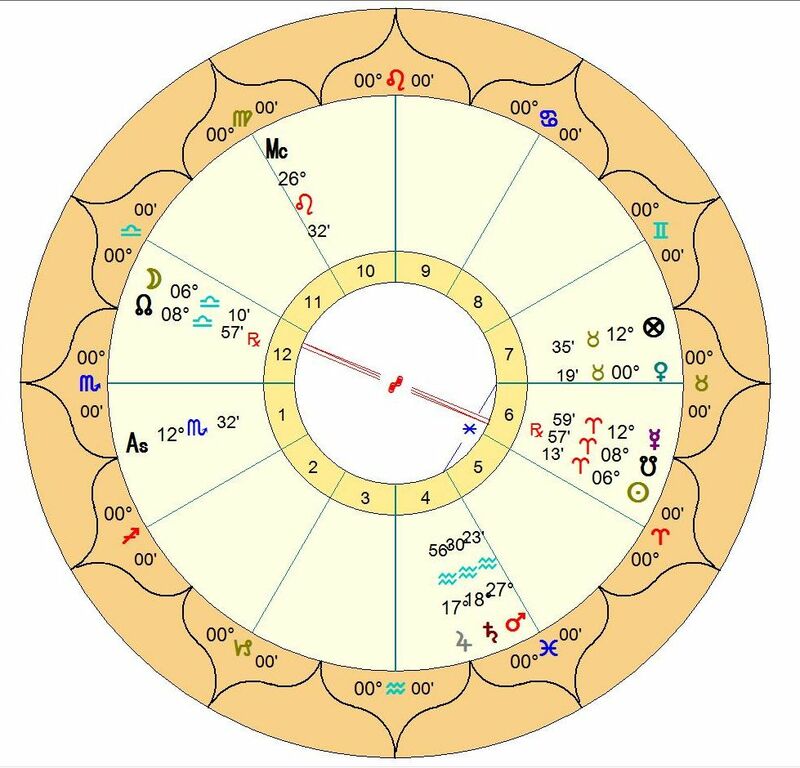 The insistence of the Conjunction in Pisces overrides any other considerations in the charts, save the alleged reference to the Sun in Virgo not only as indicative of the virgin birth but perhaps the very meaning of it. 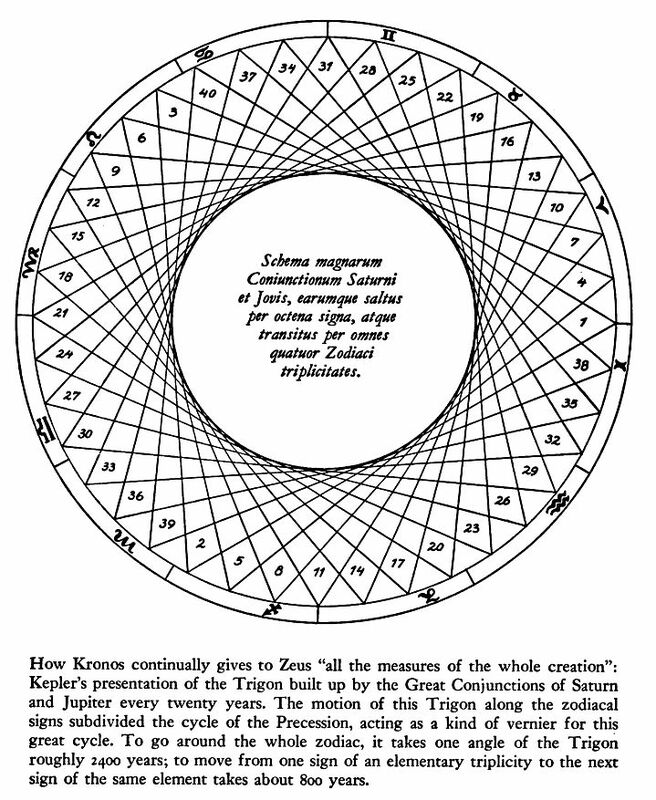 Having said that the idea that there are some elements of the Jewish community which would interpret the co-joining of the star of Kings, Jupiter, with Saturn, the star of the Jews as a clear sign of the coming of the promised king. Although it is not entirely impossible that the Sun in Virgo refers to ‘born of a Virgin’ one would have to run roughshod over a great deal of established theology. It takes as virtual fact that the entire event might be an example of astrotheology, wherein all the players take a symbolic role that can be described by the planets and luminaries themselves. At this point in time, such claims can only be considered as speculative. We have no evidence of this, either way. Extraordinary claims require extraordinary evidence. Secondly, let’s look at the Superior Conjunction referred to. It occurred 10 Sep 7 – 28 Sep 7- 3 Dec 7 19 Dec 7. 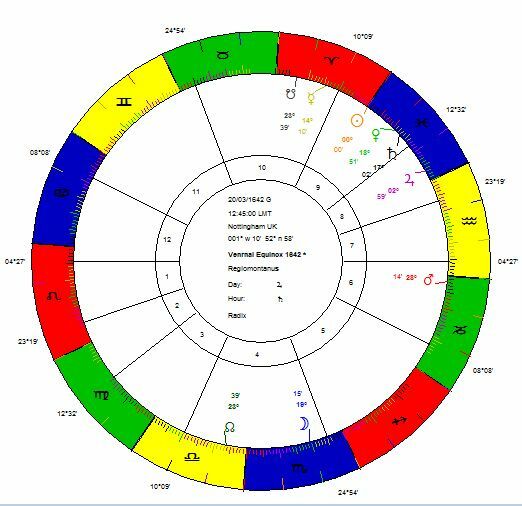 There is no doubt that the magi would be very familiar with the Conjunctions as indicators in Mundane astrology. However, they are considered most significant when there is a change in Triplicity. The previous had been in Leo. We are still left, though, with the Conjunction being the only provable element. The theory goes on to mention the Essenes. I also commented on some elements of the Essenes and pointed out that they had at least as much to do with the Zoroastrian magi as the Jews. certainly, they were not associated with mainstream Judaism. I do not doubt that this connection should be considered, but so should a very great number of factors. 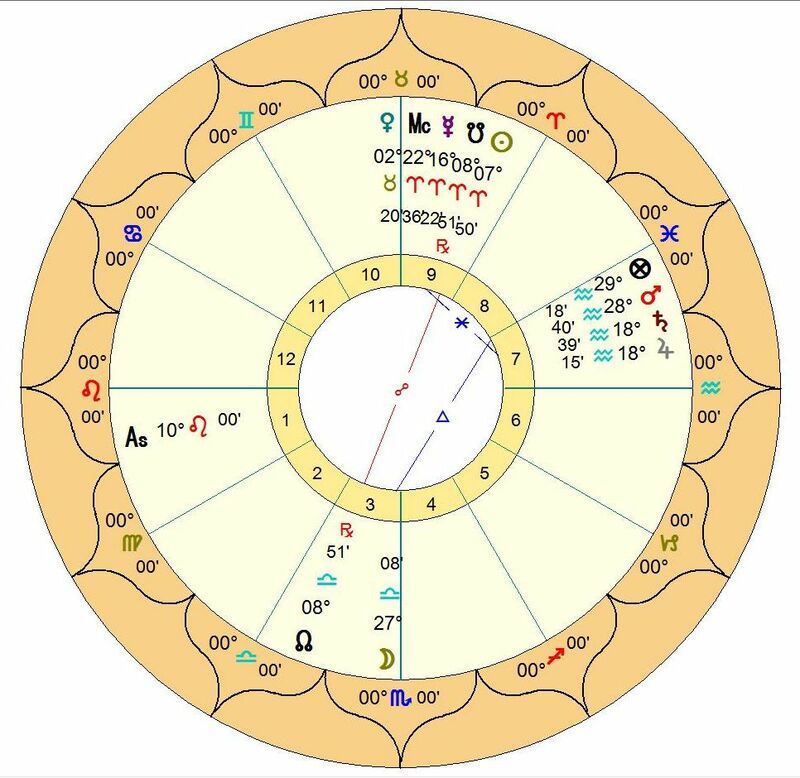 When all is said and done, I feel even more convinced that the chart I offered in the previous article fits more exactly and for multiple reasons the star in the east seen by the magi. Nevertheless, I admire the work and passion that went the construction of this theory and believe it may raise many questions deserving of research. The English Civil War had numerous causes but the character of Charles I must be considered as one of the chief reasons. He had what we might call today, delusions of grandeur. Of course in those times it was better known as the Divine Right of the Monarch. Like his father, he felt Paliament was there to serve his needs. Being questioned about them was not cheerfully accepted. From 1625 to 1629 the King argued with Parliament over almost everything, but money and religion were at the top of the list. Charles subsequently suspended Parliament for eleven years. The period is now known as the Eleven Years Tyranny. To add much fuel to the fire, Charles married Henrietta Maria, a devout French Catholic. This would heavily influence the court and to some extent the fate of Charles, particularly during the initial years of marriage. Charles liked to call her Maria, with the Catholic leaning English people calling her “Queen Mary.” The association with Charles’ Catholic grandmother could hardly be missed. 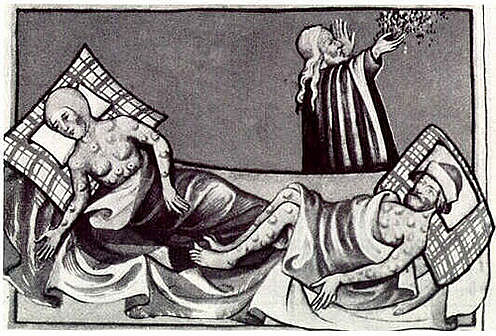 Fear and loathing of *popery* in the English seventeenth century should not be underestimated. Even so, it’s unlikely that most could have predicted that the civil war, started in 1642, would end with the public beheading of Charles. His arch nemesis is considered to be Oliver Cromwell who was among those signing the death warrant of the King. Cromwell and his circle were vindictive, not only seeking the demise of the King but the brutal conquest of Ireland. Regicide was something most would have considered impossible and probably unforgivable, but not so Cromwell. 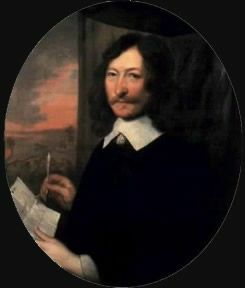 William Lilly had developed a great interest in the politics of revolutionary England. His first almanac, Merlinus Anglicus Junior, was published in April of 1644. It was immediately popular. In it he predicted the King’s humiliating defeat at the Battle of Naseby in June 1645. 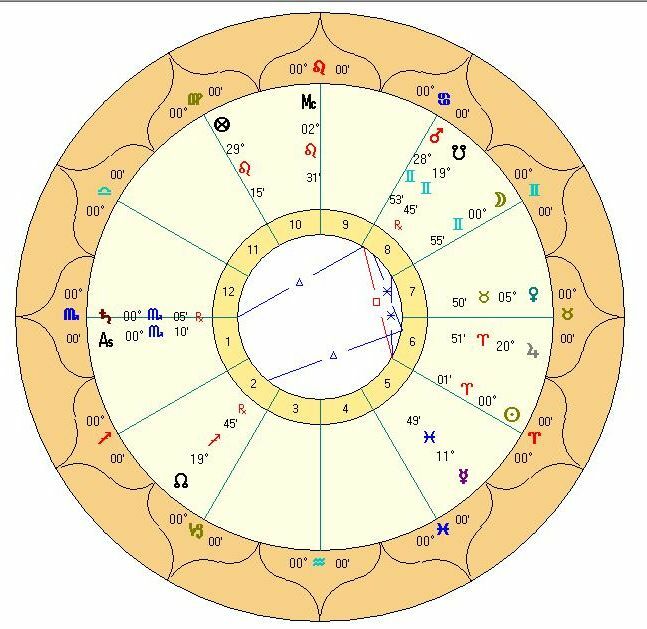 As far as I know, there has been no astrological study published on the Declaration Chart with consideration given to Superior Conjunctions as well as the preceding lunar eclipse. I’ve also drawn a chart for the Vernal Equinox to determine the Lord of the Year according to the rules of Bonatti. 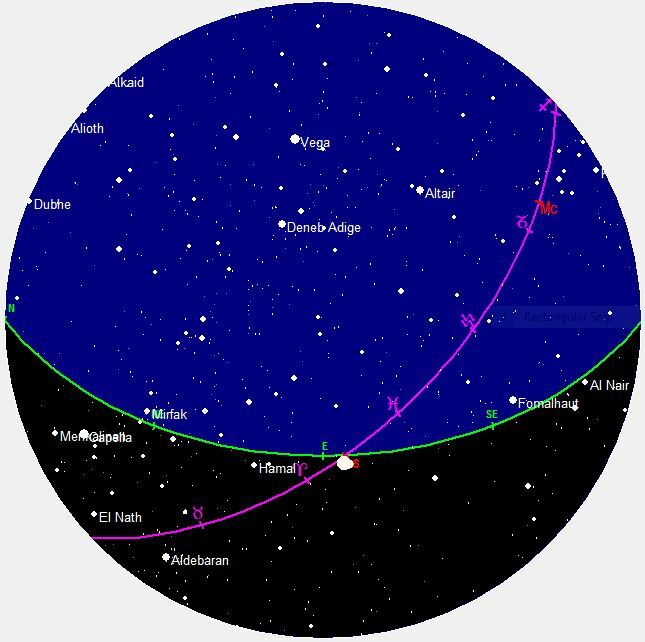 Here’s the chart for the equinox. 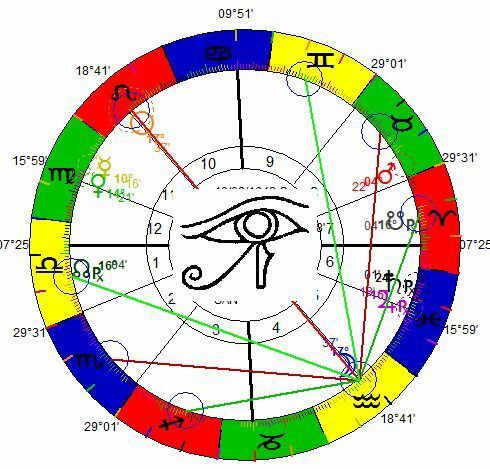 The Sun is in the Ninth House of his Joy, in Sect and Exalted in Aries. The Sun also disposits the Leo Ascendant. 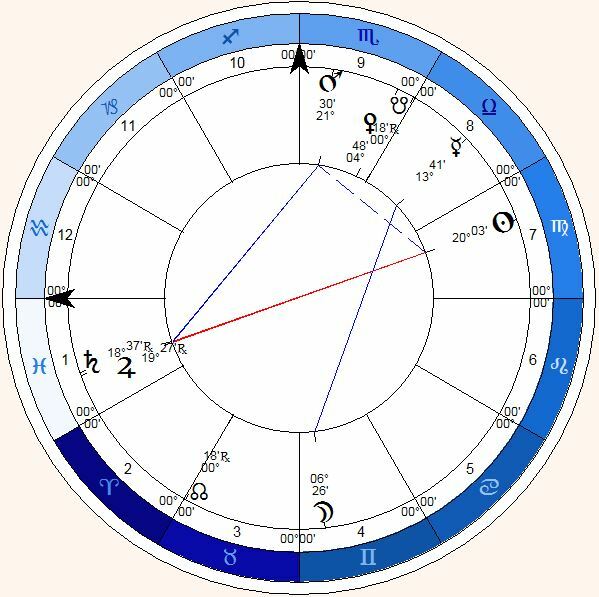 The Moon in Scorpio is separating from a square to the Ascendant, to trine the Sun as she enters Saggitarius. This is one case where the Lord of the Year is very easy to find. It’s the Sun and the Sign of Royalty. This is the annual background chart, setting the tone for the year of the Declaration of War. Let’s now look at the chart for the declaration itself. 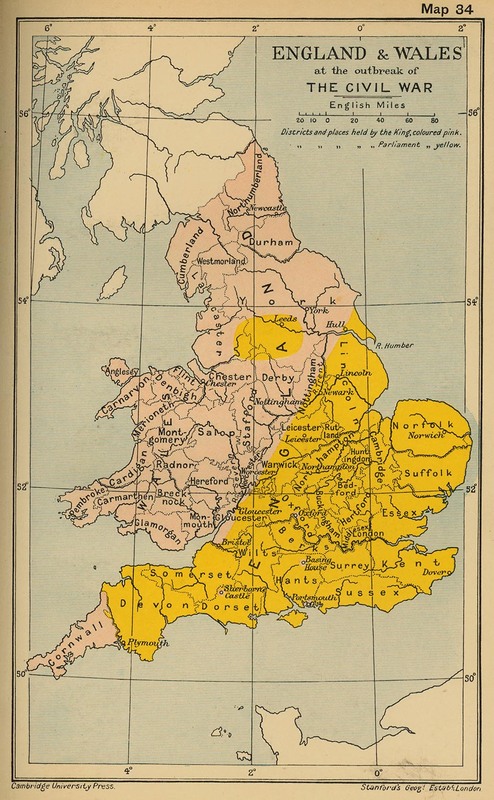 The English Civil War between the English King & Parliament began at 6:15pm on 22 August 1642 when Charles I raised his standard at Nottingham, according to John Gadbury (Campion). The Ascendant in Aquarius is disposited by a Peregrine Saturn in Pisces in Conjunction with a dignified, but retrograde Jupiter in the same sign. Saturn is the undisputed Almuten Figura. 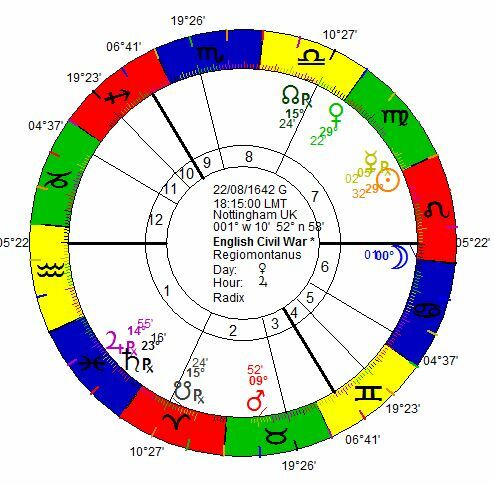 The Lord of the Geniture is Mercury in Virgo, opposed to his house of Joy and Under the Beams. The Moon at zero degrees Leo is peregrine. She is below the horizon in the sixth house, representative of the King’s subjects and servants. We can say the King and those closely associated with him were, in this respect, in essential harmony. He did have his supporters. This was to be a civil war after all. She is transiting into her domicile, but is still relatively weak and separating Mars in his detriment, Venus is in her fall. If we consider the Sun as the Monarch, we find him out of Sect and in Anorectic degree, a polite term for *pretty much toast. * The Year and Epoch of the Sun only brings our attention to the monarch and indeed the monarchy itself. There was a Superior Conjunction at 06 Leo 36 which began 05 July 1623. The next would occur 16 February 1643. It’s the end of an epoch. The element changes to water. The sign changes to Pisces. If we were to reduce the nature of the crisis to Monarchy vs Religion we wouldn’t be far off the mark. 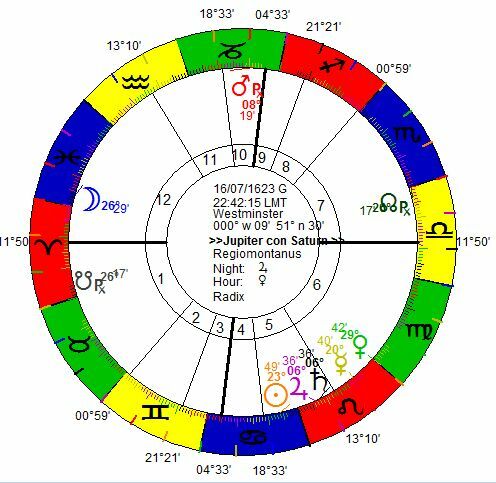 A Solar epoch is giving way to the Jupiterian epoch of Pisces.. 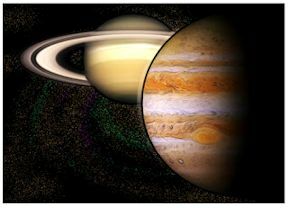 The Great Conjunctions are those of Jupiter and Saturn. The last Great Conjunction occurred in May 31, 2000,. The next will be in late December 2020. They take place approximately every twenty years. Consideration of the alignment of the two social planets is most widely used in Mundane astrology. In fact they define what we have come to call generations or epochs. I have generated the Saturn Jupiter conjunctions from 5000 B.C. to 2500 AD in pdf format. .During the twenty year period between Superior Conjunctions, they will of course square, oppose, trine or sextile one another. This is were things become a great deal more complex and will be addressed in a second article on this subject. The great eighth-century Persian astrologer, Masha’allah Atharī (c.740–815 AD) became the leading astrologer of his age. Here’s what he has to say about the great conjunctions and their importance in Mundane divination. “The principal things happen from the greater kind of conjunction, which is of the superior planets. But these superior planets have other conjunctions, even ones signifying great accidents. For the conjunction and it signifies accidents and sects. One of the best ways to get comfortable with interpreting the Great Conjunctions is to study the tables, noting the elements. Invariably, the successive Conjunctions will remain in a given element for a long periods. You can see what happened and when it happened – seeing patterns that follow this phenomena. 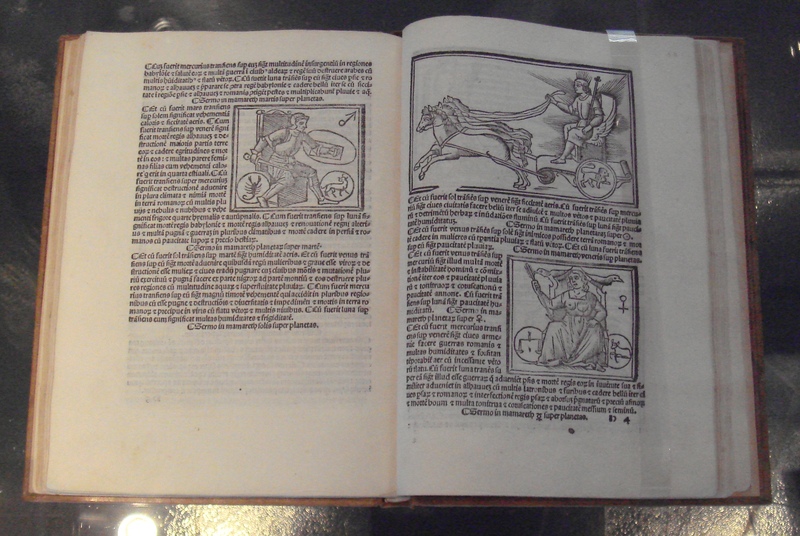 Both the thumbnails on the left are the work of Johannes Kepler. If ever the principle of a picture being worth a thousand words were true, it’s right here.